So I live in the south. But it was 10 degrees this morning. TEN. So needless to say - we have spent the day at home in our PJ's. We were supposed to have playgroup today but our poor hostess has the stomach flu so we have had an unexpected day home and Harper is on her second nap. It's a Christmas miracle! This Friday on our Show us where you live tour - we are scheduled to do Christmas cookies/goodies. And then I think I had Christmas decorations for the Next Friday but we are going to move that up to Monday to Match the Nester's tour. So we can all be on board. You can link up here and at the Nesters. Or either or neither. I'm trying to decide if I want to continue doing Show Us Your Life Friday after December. It's been SO much fun. And ya'll have given me great ideas. I honestly thought it would last about 6 weeks and it's gone about 6 months. We can keep it going or we can stop - what do you think? Ya'll are always asking me how I keep my house so neat. Well being a very Type A OCD person - I just constantly clean and pick up. But it's getting harder and harder now that a little person is on the move pulling things out left and right these days. ha! My house is looking more like this. She has really started cruising - holding on the to furniture and walking this week. And she crawls from room to room at lightening speed. This morning she scurried into her room and shut the door. I saw a flash of my future - only it was a 13 year old slamming her door I saw. ha! And probably putting up a sign that says "keep out". ha! Yesterday I was trying to cook dinner so I put her in her exersaucer for a little bit and turned on "praise baby" which she normally loves but she was HATING it. 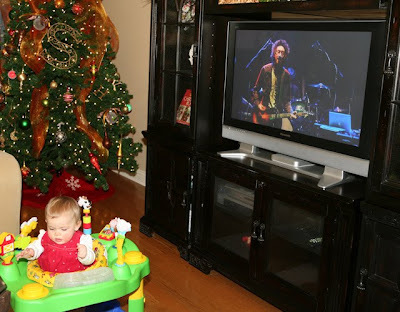 So I turned on David Crowder's Remedy Tour DVD and she started clapping and was so happy. So the girl has taste. ha! That's about it - I have a roast in the crock pot and bathrooms to clean - so have a good night! I was so excited about that tour on the nester and then I noticed it started at 8:00 eastern time!! I'm in a coma at that hour, so I'll be number ten thousand on the tour of Christmas decorations. I have loved the "show us your life" posts! I have only been able to participate a few times, but its been wonderful! Enjoy your cold day inside, it is cold here in KY too. We had 13 wind chills this morning... Unfortunately, I still had to come to work! We live in South Texas. Although, we did not see snow here last weekend other places did. It was warmer in Chicago than here. No joke. When we bought our daughter's heavier winter coat the clerk told us she would not need it. HA! My favorite thing in your kitchen is the LARGE Sonic cup!!! Ha! Of course, my favorite person in there is beautiful Harper, but that cup has me craving some Vanilla Root Beer! i'm so jealous of you type a ocd people. if i had just a little of that my house could be so much cleaner. WOW, hearing 10 degrees makes me feel blessed to live in Florida, haha!!!!!!! :) Stay warm!! I have also enjoyed seeing other's ideas and homes. If you have more topics, let's keep it going! I haven't made many comments as it seems by the time I see you posted something new my comment would be way past the 70 mark and I don't think you would see it. However now that I am #7 verses #70 I just wanted to let you know that I really enjoy your blog and read it often. Also, I like the "show us your life" posts it is fun to see what everyone is doing! We live in the midwest and I hear ya on the cold temps, stay warm!! I really enjoy reading and participating in the Show Us Your Life posts. I say keep them coming. I love the Show Us Your Life posts. It is fun to see what other people do and I have found some great blogs that way. So, my vote is to keep doing them! Love the pictures of Harper. oh and by the way...I love the Show Us Your Life tour!! I think it should go on!! Love your blog!!! Excited to try to win the PC - Harper is such a cute girl!! I too am OCD - it is a good thing - LOL!!!! :) Harper is so cute! Don't worry about when she turns 13..my mama is still my best friend to this day and I'm 21 now. Annnnd...I love show us your life. I totally want to keep doing the Show us Your life posts! I love them! 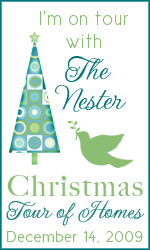 And yeah for linking up to the Nester's for Christmas decorations! I cannot wait! Oh and nice Sonic cup on the kitchen counter! LOVE IT! Love the Sonic cup..haha. I have been craving a Sonic Vanilla Diet Coke but woke up to late this morning to make a run. Harper is such a doll. Ive loved the show us your life posts but if you have no more ideas then it will always be a good reference. Kelly - I have loved the Show Us Your Life posts, though I have only participated once. Maybe you could just give it a rest and then resurrect it at a special time instead of totally doing away with it. I'm only comment 21 ...not 450! I love the Show Us Your Life and just started doing it, along with my blog. Please keep it up! :) You are one of the neatest ladies ever...and we've never met! I feel close since I'm a southern Missouri girl myself and you are just "below" in Arkansas! BRR...it was COLD here too! Oh my..you were colder than me in NH. Wow! We did get our first snow day yesterday though and a great lazy day to go with it. I am that type A OCD cleaner (or more of a was) until I had 2 children. Now I have let up a tad for sanity sake. just an FYI... I have bought tights exactly like that from the brand mudpie (www.mud-pie.com for retail locations) I love those! I loved looking at the show us your life posts. If there could be more, I think that would be SO great! It gets me SO inspired to get my house in order(even the little parts that only I see!) If there could be some about organizing or projects or decorating that would be AWESOME! Another vote for keep it going. I can't wait for the Christmas goodies! Is that Santa on your counter a cookie jar? That is so cute! Any idea where I can get one? "I have a roast in the crock pot" -- ha! Where do your skills end, girl!?! I don't have any OCD or type A in my entire body.....so maybe I'm biased but THAT IS THE CLEANEST KITCHEN I HAVE SEEN IN A LONG TIME. We are coming over for roast! Love that she slammed her door. haha! That is so funny that she loves David Crowder. Like mother like daughter. "Cleaning your house while your kids are still growing is like shoveling the walk while its still snowing". Phyllis Diller. I am so on board with being Type A and OCD cleaner...but this thing called college finals happened! Fortunately, I'm on track to reclaiming my apartment! You do a great job, Kelly! I am a type A personality and a creative mess that is constantly in combat. My kitchen and living areas are always clean...but the office and bedroom...not so much. Ha. I love the Show Us Your Life.....it's such a fun way to find other bloggers and to get lots of ideas!! Thought you might find this funny :) We LOVE your blog - and your wardrobe, haha! lol, i'm in alaska and it's like 15 up here! it was 30 below a few weeks ago though, so this is like a heat wave! not really, i still hate the cold. funny the south is colder than alaska right now! I have been a lurker for so long. Loved this post. And your daughter? So cute. If it's any consolation to you when i woke up this morning it was -18 below with a windchill of -30!! haha, glad you got a kick out of it - its our new favorite thing to wear! Comfy AND cute! I am a 1st born, Type A OCD kind of gal to and I really used to hate it! ha! But now I give thanks for it cause if our doorbell rings...10 seconds and bam I'm ready for company! Keep up the weekly tour; I really love checking out everyone's stuff and seeing ways to improve our home! http://www.etsy.com/view_listing.php?listing_id=34782729&ref=sr_gallery_1&&ga_search_query=bloomers&ga_search_type=handmade&ga_page=&includes=tags&includes=title this would have to be the CUTIEST little girl 1st birthday outfit!! UGH! I so wanna little girl next! CUTE! Continue the Show us your life. I know I have only been able to do it a few times. Even if you only do it once a month that would still be good. We are totally the same person. It just cracks me up. I walk through room by room all day long picking and cleaning up things. If Connor stops playing with a toy for ONE SECOND I am like "Go put that away!" ha! It is COLD! Hope ya'll have a snuggly night! picking up and cleaning bathrooms... cleaning done with grace. Great job, and way to redeem the mundane tasks for the glory of Jesus! We have gotten to the point that if I have ANY thing I need to do, Spencer knows that if he starts pulling out everything in the kitchen, I stop doing whatever it is that is keeping me from him, and I pick up/take away. Needless to say, it has of late become impossible to "do" anything but him while he is awake these days. I know it is just a stage of life, but my wreck of a house is driving me crazy. Basically I have to choose, a neat house or laundry? A neat house or dinner? A neat house or getting dressed for the day? But he (and Harper) sure is (are) cute! Your house still looks WAY CLEAN and NEAT to me!!! Sometimes I can't even see the countertops in our kitchen or the rug in the living room--which drives me CRAZY, but I've about given up trying to keep it neat. I just keep telling myself that I'll be so sad when they're all grown and gone and I'm sitting in my perfectly neat, quiet, lonely house wishing someone was here to mess it up! With having five kids I feel your pain. But I giggled at the Sonic cup on your counter! I remember how much you used to talk about your drink from there. I do love the Show Us Your Life posts. They're always so fun to write, and to hear what everyone else is saying. And while part of my likes the idea of having them go one forever, it might work to take a break. And then bring it back next fall or summer. Wow, I thought it was cold here! Flint keeps reminding me of how cold I use to always be there! HA! Thank for Lord for the exercaucer. It can usually buy be a shower and whipping up something quick for dinner! 10 degrees? We're not THAT far from you, but we've NEVER seen 10! I'd have to move. I don't know where. Hawaii? Love your "show us your life" posts please continue them. I think you should keep doing the Show Us Your Life. It's so fun to get a peak into other peoples lives. Stay warm! It's 14 degrees tonight...brrr! 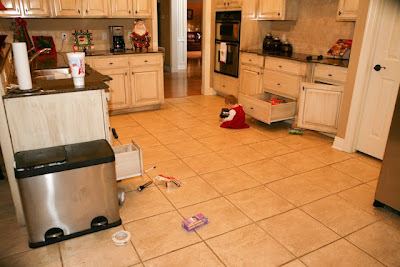 I am OCD, too, and I'm constantly following behind my kids, picking up after them! Please keep doing Show Us Your Life! I really enjoy it. My daughter is about a month older than Harper and it's almost impossible to keep my house clean these days. I spend half my day cleaning up after her. We live right outside Memphis, and it was 24 degrees (felt like 14 according to my Iphone) when I stepped outside this morning. Seriously, in Memphis? So not typical. We would have had a pj day except that my oldest had to go to the doctor for an ear infection...yuck. And it'll probably be 65 degrees on Christmas Day...we have the craziest weather...but we love it here! It was SOOOO cold today. When I took Brody to MDO around 8:45 my car said 15 degrees. It was such a beautiful day though! Ok, Kelly, true confession since you know and love me. I am pretty OCD about my house, but now that I have 5 little uns' I realized sometime last year that it had sort of become an idol for me. How could I be a more laid back mom, enjoy my kids, not fuss about the mess so much? I started to wonder if I would even like me as a mom. I had to honestly take baby steps...like I started with "Ok, we will not pick up the house til about 10 min. before Papa gets home." It killed me to walk thru and see toys,etc. but through that God helped me do better. I am not offering this as advice to you at all, you are doing great. Your post just reminded me of what I felt God told me and where it took me. I am thankful. I think I'm more fun now. Thanks, God! I would love for you to continue the show us your life. It has been fun to be inspired by everyone! My daughter is just about 4 months so I know that we are just around the corner from a messy house all the time! My house is normally clean, but with unpacking from not moving..everything is crazy cluttered. Oh well, it's lived in. LOL Please continue to do Show us Fridays. I just love it. I really want you to continue doing Show Us Your Life. I just recently started blogging and I have been so excited to start participating in it. still, your messy house looks better kept than my clean house. I just cannot keep up with it and 2 boys that undo everything I do.